According to the U.S. Bureau of Labor Statistics, Americans have spent an average of 5 hours every day engaged in sports and leisure activities. To most people, best iPhone sports games are popular, for they combine advanced graphics with simple and touch-based controls. However, there are various iPhone sports games online, and not all the users can find the right one for themselves. Hereby, we have tried different best sports games iPhone user like and recommended 5 of the best sports games for iPhone. Take some time to read this article and get the iPhone sports games you like best. 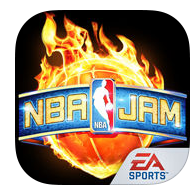 Play with all 30 NBA teams and your favorite NBA stars! Unlock legendary players from the classic arcade era like Scottie Pippen, Dennis Rodman, Dr. J – plus some secret players you can only get on iOS. Go crazy in the game on your iPhone with all the over-the-top, high-flying, 2-on-2 arcade basketball action just like you remember it – and like you have never seen before! Go to the hole. Go strong. Go for one of the best iPhone sports games, the monster jam. 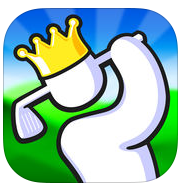 The award winning, Super Stickman Golf series, is one of the best sports games iPhone users could find! Super Stickman Golf 3 is packed with interesting elements like new courses, power ups, collectable cards, game modes, multiplayer madness and a ton of new surprises for you to discover. What is more, it’s a new spin on a classic game! After trying this iPhone sports games, you know you are the best golfer around, so prove it by unlocking all the characters, hats, ball trails and more. 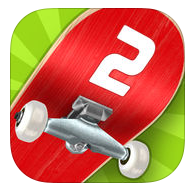 Touchgrind Skate 2 is one of the best sports game apps for iPhone that is a must buy for hours of action packed fun! It’s got the most realistic multi-touch skateboarding game ever and allows you to skate like a pro! Achieve the highest score in time-limited Competition mode, rip freely and complete challenges in Jam Session mode. You can also interact with your friend in the game by challenging them in the turn-based multiplayer game or sharing your gameplay experience with your friends by exporting video clips of the game. 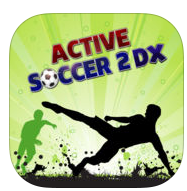 As one of the best iPhone sports games, Active Soccer 2 DX is an exciting top-down arcade football game providing a fast-paced arcade experience. The game is fun to play, easy to control but hard to master, the more you play, the more you are familiar with it and the better you can play. And Active Soccer 2 DX provides a complete career mode, implementing many international leagues, cups and championships. The million-selling Backbreaker Football is back with a vengeance – and this time YOU tackle! 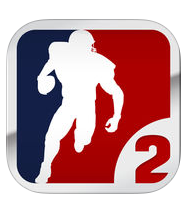 Backbreaker 2 again brings graphics, physical animation and pure fun of mobile games to a new level. Beat the ball carrier in Vengeance Mode, or fight your way to the endzone in the classic Tackle Alley mode. Whatever you do – this is the best Backbreaker yet, so enjoy the ride! If you want to move your sports games to iPhone for your entertainment with convenience. Here we will recommend your a powerful third-party tool – Leawo iTransfer to complete this transfer task. Leawo iTransfer offers a good solution to the transfer issue between iOS devices and computer. Multiple kinds of files are compatible with this transfer software, such as photos, games, music, videos and more. Prompt and safe transfer is assured in this software. Moreover, the transferred data can be backed up with no data loss, and 100% security and reliability will give you original quality of the data to your destination folder. Below we will instruct you the details of how to transfer sports games from computer to iPhone with iTransfer. ☉ Support the latest iOS devices like iPhone X, iPhone XR, etc. 1. Run Leawo iTransfer on your computer and connect your iPhone to your computer via USB cable. 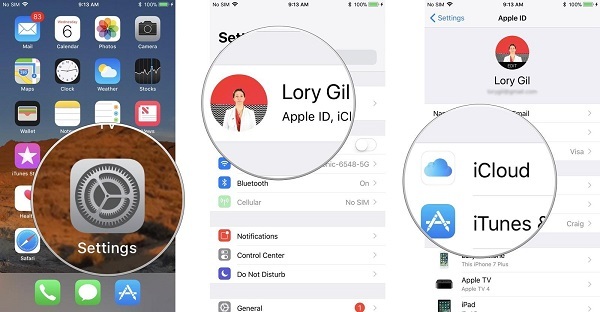 Your iPhone will be detected automatically and the detailed information of it will be shown in the left sidebar of the software window. 2. Import the sports game files from computer to the software. There are four ways of adding files to this software. I. Drag and drop the games files to iTranfser software directly. II. Press the button “Add” on the middle top of the window, which is next to the left sidebar. III. Click the button “ File > Add > Add File/Add Folder” on the upper right of the window. IV. Right click on the library and select the option “Add File or Add Folder”. 3. The transfer will begin to work once you have finished adding the games files to iTransfer software. You will see the transfer percentage in the pop-up dialog, where the name and quantity of the files will be shown to let you know more details in the transfer process. Remember do not to disconnect the iPhone to computer until the transfer is completed. A lot of people, especially those who are skilled at a game, would like to record their gameplay and share it with other people. It’s an easy thing to do on PC but on mobile phones like iPhone, screen recording isn’t that easy. But on iOS 11, Apple introduced to us a built-in video recorder that would allow us to record the screen directly without having to install a third-party program. If you are using a device running iOS 11 but don’t know how to use the screen recorder, check out the instructions below to see how you can record your gameplay of the iPhone sports games on iOS 11. We’ll take iPhone as an example to show you the whole screen recording process on iPhone. 1. 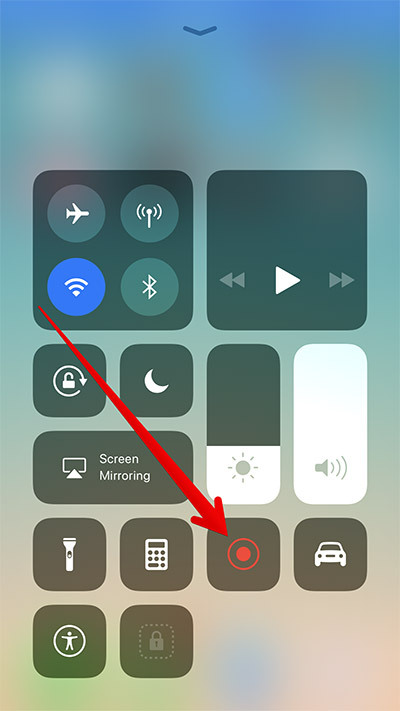 The shortcut to the screen recording feature is placed in the control center, so on your iPhone, open the control center and then tap on the screen recorder icon which looks kind of like a dot with a circle around it. And with a countdown of 3, the screen recording will start automatically. And you will see that the status bar turns to red. 2. There are two ways of ending the screen recording. 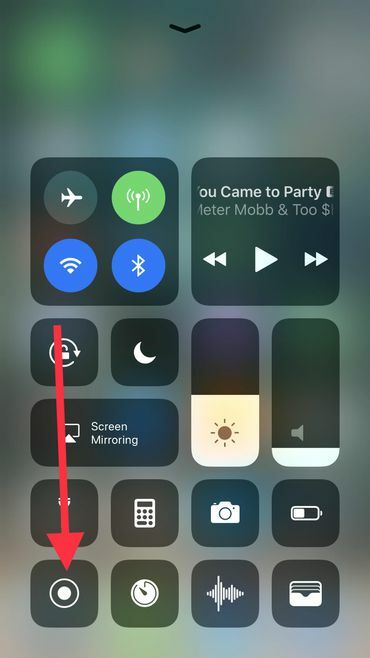 One is to bring up the control center again and tap on the screen recording shortcut again. The second way is to tap on the red status bar and manually confirm you want to stop recording. Afterwards, you can check out the recording in the Photos app. Sometimes we might not have time to actually play sports or people to play sports with, but with these iPhone Sports games, you can enjoy them on your iPhone. They are totally different things but you can still have fun and that’s what matters. You can back up the sports games app on your iPhone with iTunes or iCloud. It is easy to recover it from iTunes or iCloud in case of accidental removing. Here we will introduce you the method of how to backup sports games apps and data on iPhone with iTunes and iCloud. 1. Enter settings on your iPhone and tap on “Apple ID” on the top of iPhone screen. 3. 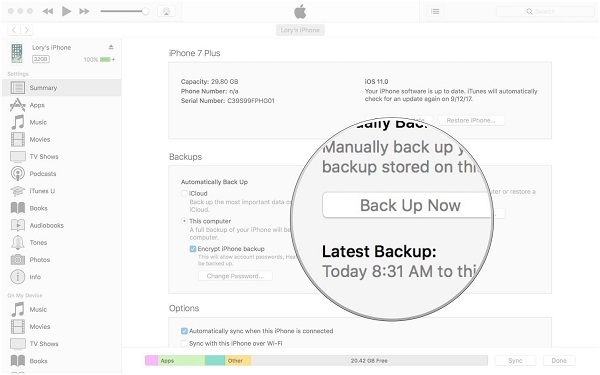 Tap the option “iCloud Backup” and switch the button to the right to enable iCloud backup, then Tap on “OK”. 4. 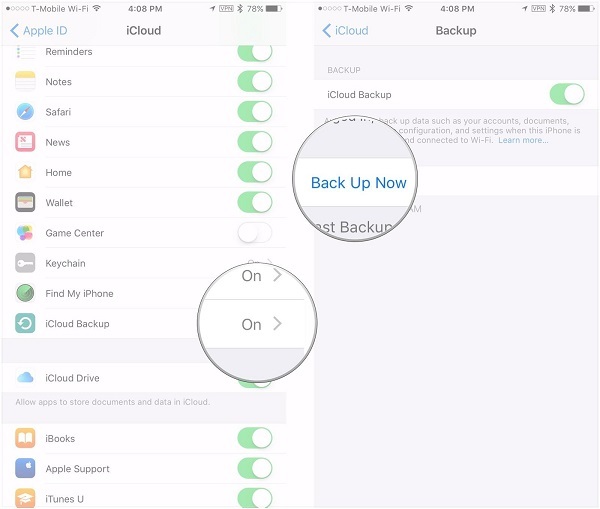 Tap on “Back Up Now” below the option of iCloud Backup. You should note that before your sport games apps will be backed up to iCloud, make sure that you have set up an iCloud account to log in. 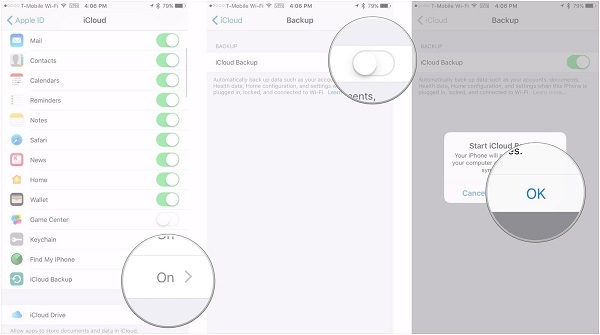 Then you can follow the above steps to back up your games apps to iCloud smoothly. 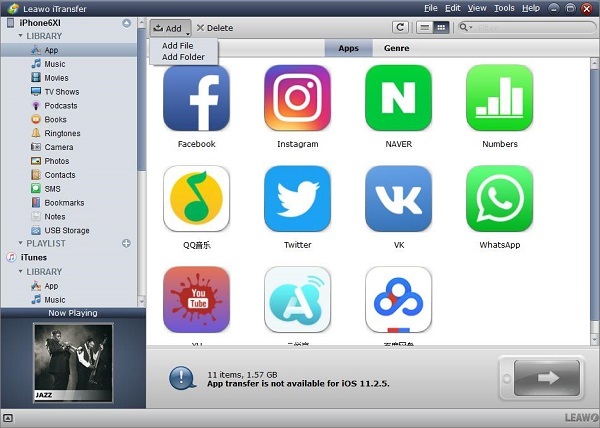 If you want to back up the sport games apps with iTunes, the instruction below will teach you the detailed steps of it. 1. Connect your iPhone to computer and run iTunes on your computer. 2. Click the icon button of “Device” beside the left sidebar of the window. 3. Select the option “Summary” in the left sidebar. 4. Enable the button next to “This computer”. 5. 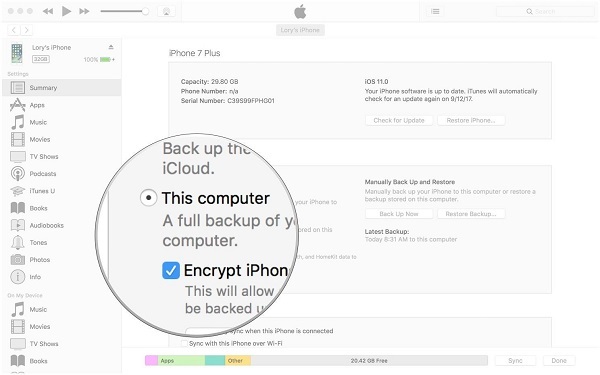 Select the checkbox of “Encrypt iPhone” to make sure the password is protective, then click the button “Done” when it is completed. Automatic backup is also supported in iTunes, you just need to select the option “Back up now” below the option “Manually Back Up and Restore” after you have selected “Summary” in the left sidebar. 1. 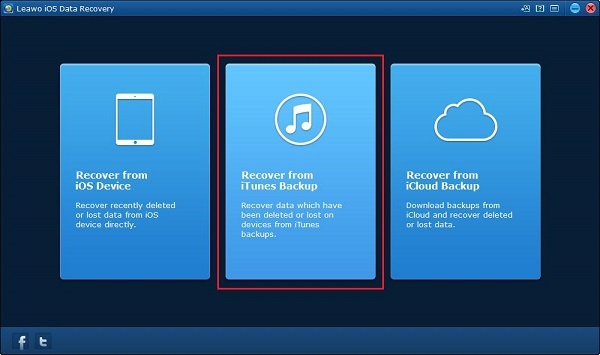 Run iOS data recovery on your computer and choose the mode – Recovery from iTunes backup. 2. 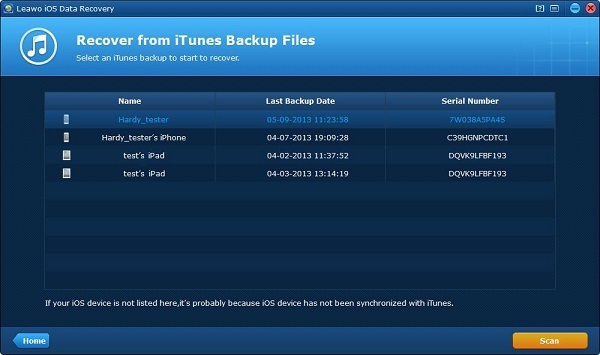 A list of iTunes backups coming from your multiple iOS devices can be seen after you have selected Recover from iTunes Backup. 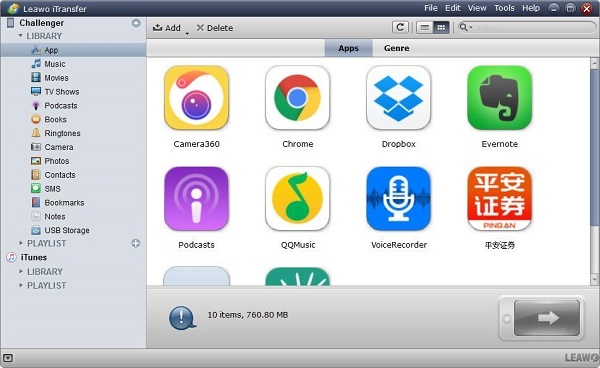 As you have back up your sport games apps in your iPhone’s iTunes, you should select your iPhone in the list and then click the button “Scan” to begin to scan your backup files in the iTunes which the data have been backed up from your iPhone. 3. All the recoverable data will be listed on the left part after the scanning is completed. You can check the option “Only display the deleted items” to view the lost data only. 4. Click the button “Recover” on the bottom right of the window when you have selected the sport games apps you need to recover. Then a pane will pop up and require you to choose the target folder to save the recoverable sport games apps by clicking the button “Open”. Or you also can check the option “Automatically open the output folder after finishing recover”. Finally, click the button “Go” to begin to recover the selective sport games apps. If you are also looking for other types of games to play, check out our recommendation of the top 5 racing games on iPhone. You’d be surprised how many great games you can find on iPhone.